Do you like to try new things? Maybe work on a new skill or buy a new product and then try it out? 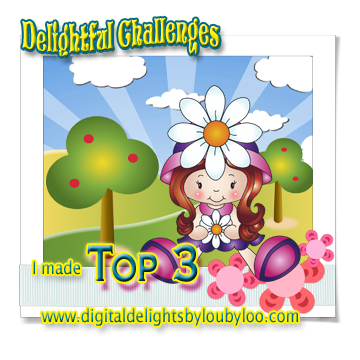 Well, you have your chance this week at Di's Digi Designs Challenges! 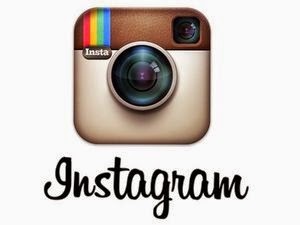 For the next 2 weeks, the theme is "Try Something New!" It took some thought to come up with what I was going to try. A new coloring technique? A new product? A new card fold? Then, I saw a similar card to this one on a blog and had to try to figure out how they did it. I love a challenge! I'm not sure what you call this -- see through the middle? peek-a-boo? It's created with a piece of acrylic in the middle, where normally there would be card stock. The next time I try this, I'll try to make the focal point smaller, but for the first time, I'm satisfied. I thought Ellie, with her bouquet, was a great showcase for this card. Ellie's adorable, isn't she? I colored Ellie's Bouquet with Copic markers. The papers are from Paper House. I've never used them before (another first for me), but got them in an order I placed from England. The 'dream big' sentiment sticker was in the papers. Little Ellie has big dreams, I think, so I decided to use it. 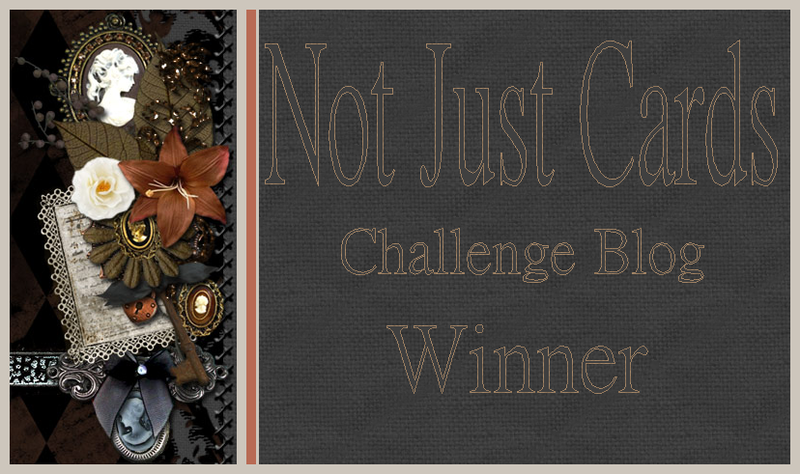 I hope you can join us at Di's Digi Designs Challenges these next 2 weeks for our Something New challenge. You have a great chance of winning if you use a Di's Digi image, and there's top 3, plus a random winner. Check out the shop for all the awesome digis and stamps, plus some really great bargain digis. It's Friday, and near the 4th of July, so I have a patriotic pup to share with you today for the QKR Stampede Challenge blog. The challenges are every week, and they are always Anything Goes! I haven't talked about this on my blog yet. It's so painful, I hate to share, but feel I must. Last Thursday, June 21, we had our beautiful Golden Retriever, Gracie, spayed. She was just a year old on June 17. She died of complications from the surgery on June 24. It is such a loss for my husband and I. Having no children, our pets are our 4-legged family. She was the dog that was going to help me recuperate from cancer and be with me in retirement. Less than a month into my retirement, she is gone. We are deeply grieving her loss. I colored Patriotic Puppy with Copic markers. The star studded background was created with a file I found at the Silhouette Design Store, cut out on my Silhouette Cameo 3. The multi-star ribbon is from Really Reasonable Ribbon. 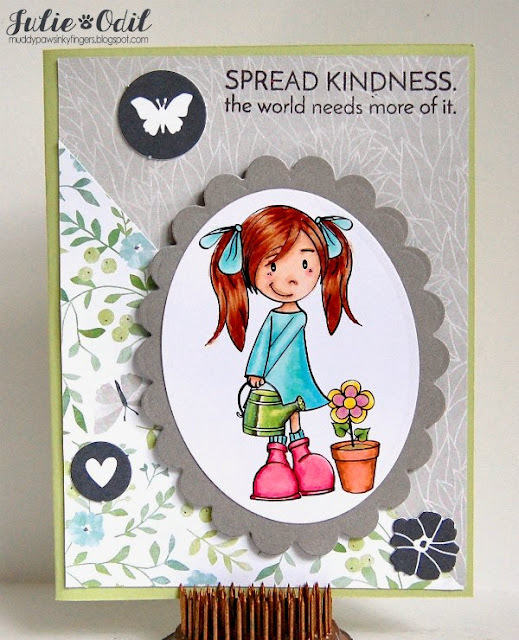 The sentiment is an acrylic stamp from Paper Wishes. It's my first DT post for Aloha Friday Challenges. Such a fun team to be a part of! 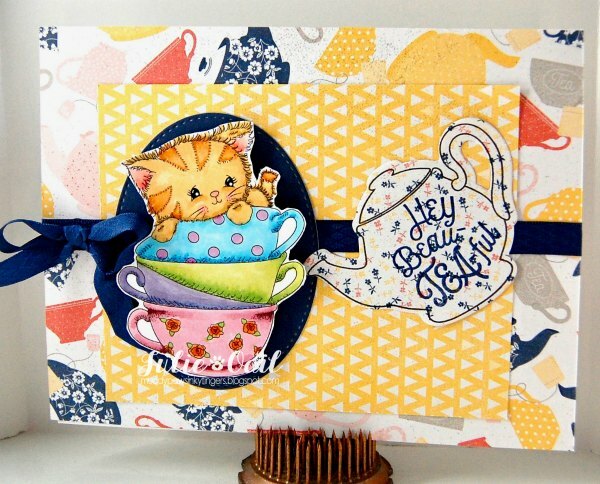 I get to work with the adorable Kitty Bee images, plus images from various sponsors. Yeehaw! 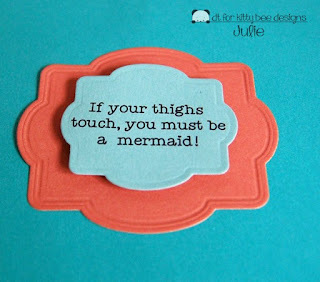 For this challenge, the theme is "Under the Sea " - must include sea creatures: fish, dolphins, sharks -- mermaids OK. 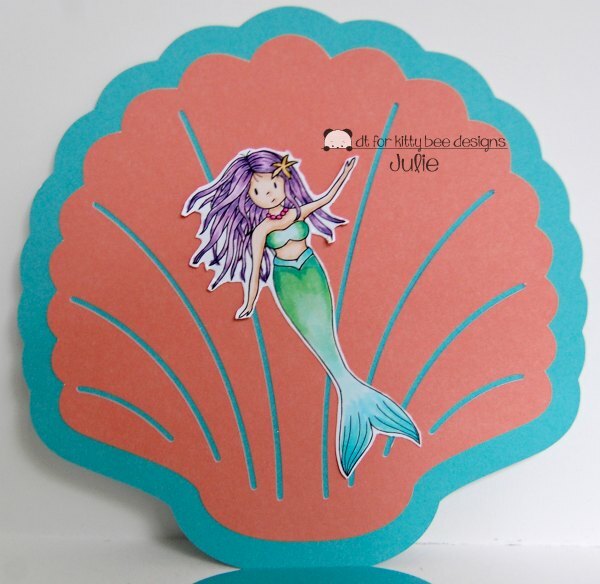 The shell shaped card is a design I found in the Silhouette Design store, and cut out on my Silhouette Cameo 3. Don't you love that sentiment? It's not original, but I computer generated it. 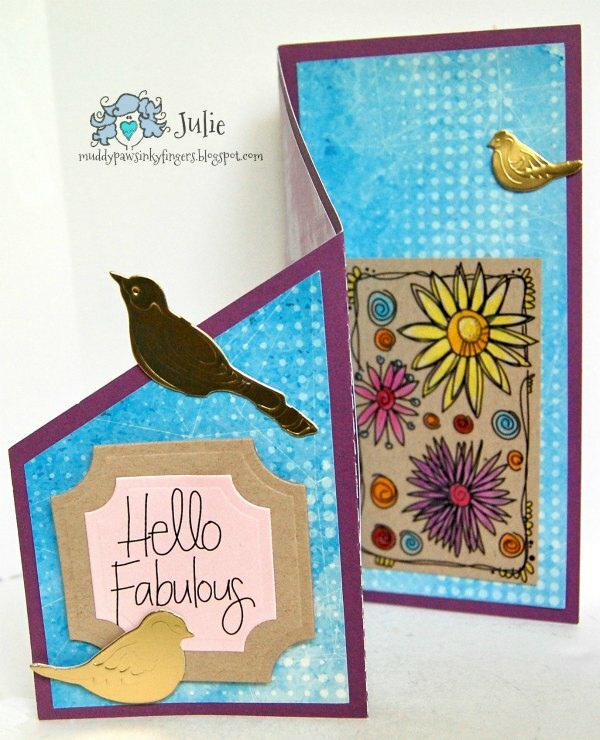 I used a couple matching Spellbinders dies to cut it out and back it. I hope you can join in on the Aloha Friday "Under the Sea" Challenge. You have until July 6 to link up. Celebrate! It's not too long now until Independence Day here in the US. My small town goes all out. It's the 2nd biggest day of the year, next to Christmas. The population of our city is just over 2000 people, but on July 4th, we swell to over 10,000. The crowds love our festivities, too! To start getting in the patriotic spirit of the 4th of July, I created this card using the Cupcake image from Kinda Cute by Patricia Alvarez, and went with a patriotic twist, then made it into a shaker card for even more of a festive feel. I colored the cupcake digi with Copic markers, then fussy cut it. 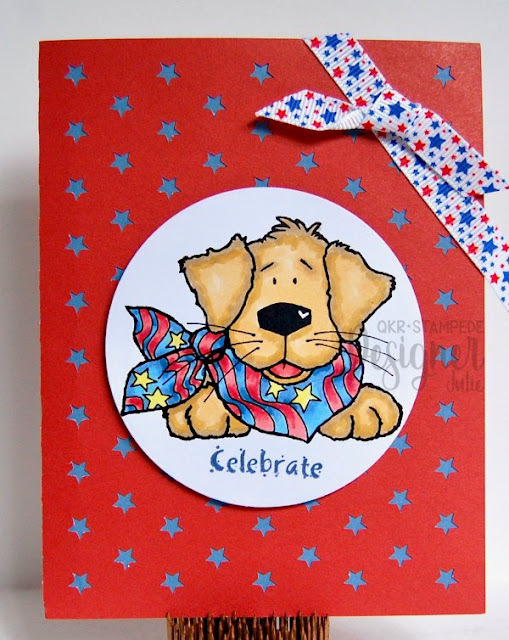 The patriotic papers are also from Kinda Cute by Patricia Alvarez. They are the Red & Blue basics collection. Don't they work well for this shaker card? Well, that's it for me for today. I have to get out the bunting, the flags, find the sparklers, get Gracie the dog decorated -- there's TONS to do before the 4th of July! I hope you find time to visit the Kinda Cute by Patricia Alvarez Store, and the Kinda Cute by Patricia Alvarez Facebook Group. 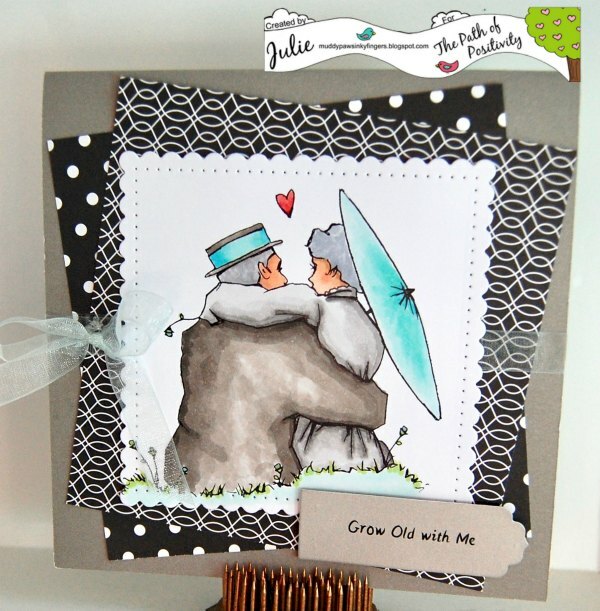 I'm posting today on the Scrapbook Stamp Society blog with an adorable boy Besties image. Sling Shot Joe looks just a bit mischievous, but like he's definitely enjoying the summertime! He was a joy to color up. You can find him, more Boy Besties, and tons of other My Besties products in the Sherri Baldy My Besties Shop. 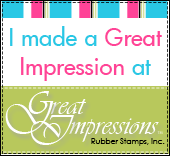 Happy Sunday, stamping friend! I'm guest designing again this Sunday at The Outlawz for their Sunday Songs & Rhymes Challenge. I was there last week, too, and I had so much fun. This week, the song is Lavenders Blue. It's a modern Cinderella song. So, what better than Cinderella's shoe, right? I used an SVG cutting file from The Cutting Cafe to make this high heel shaped card. The papers are a stack from DCWV. I found the Cinderella quote on line, but I'm sure she said it! The embellishment is from Close To My Heart. There's not much else to say about this card. It rather speaks for itself. I want to thank Lynn Cupido and the rest of the team for the opportunity to guest design both this week and last week. I had a wonderful time, and I know I'll be back participating in more Outlawz Sunday Challenges! Thanks for the wonderful opportunity! Today is the second showcase of this month's New Releases for All Dressed Up Stamps. I don't know how Wendy does it, but she comes up with the cutest designs each month! 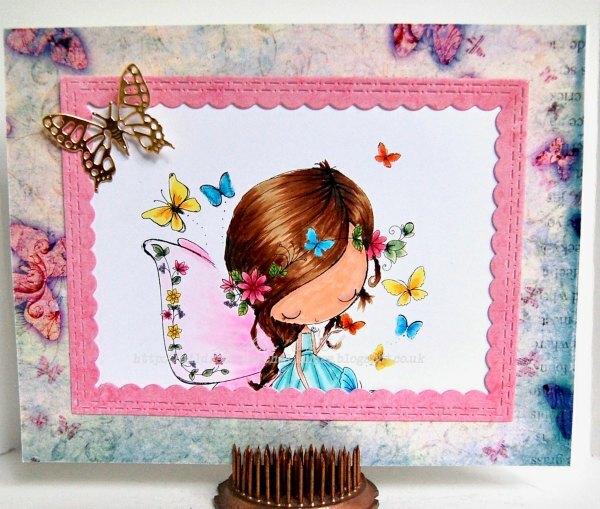 I colored Butterfly Wings with Copic markers, then used some digital papers from Prima, purchased at Snap Click Supply to create the card The frame die cut is from Craftin' Desert Divas. The gold butterfly is a die cut from Sizzix. You can see more of this month's new All Dressed Up Stamps new releases on the All Dressed Up blog, and in the All Dressed Up Facebook Group. Please join in on the challenges there, too! Bonjour, mon amie! It is Friday, and I have exhausted my very limited Francais, so the rest of this post will be in English. 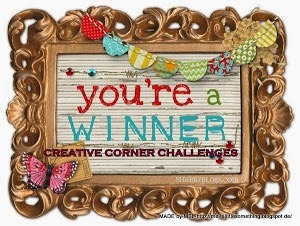 There is a new challenge starting today at the QKR Stampede challenge blog, where the themes are always Anything Goes. This cute doggie digi from QKR Stampede is Doggie Bone (Q-digi24143, colored with Copic markers. He's a handsome fella, isn't he? The papers are all digital, found at the Silhouette Design Store. The sentiment is computer generated from my vast knowledge of French (ha!) 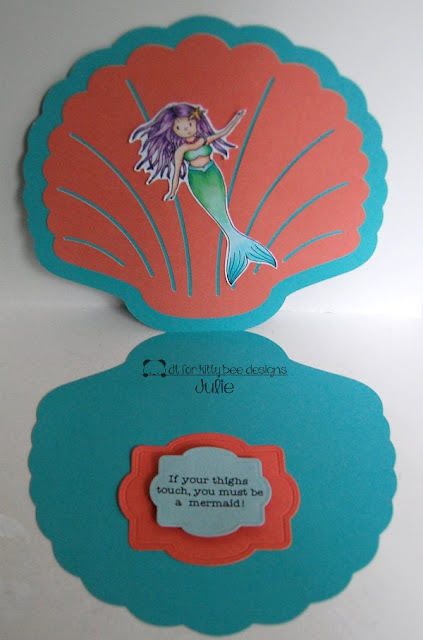 There a bit of Close To My Heart glimmer trim on the card and some CTMH card stock. I hope you can join in on the challenge fun at QKR Stampede Challenges this week. I love to see what everyone creates, and we have the best digis for prizes -- like this one! 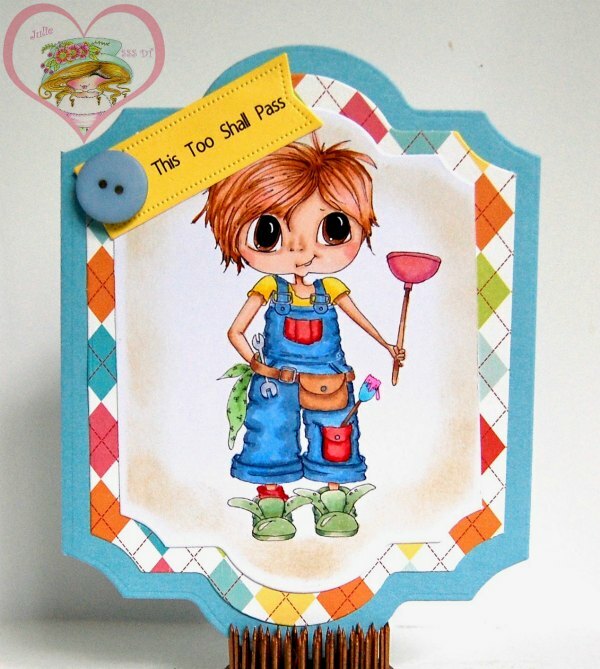 I'm pleased to be guest designing again today For Sasayaki Glitter Stamps. It's the second time for me this month, and it's such an honor. I was on their design team until full-time work and poor health became too much for me. I have missed coloring up the beautiful and fun Sasayaki Glitter Stamps. I have colored Beeutiful with Copic markers. I cut out the card base on my Silhouette Cameo 3 with a file I found in the Silhouette Design Store. 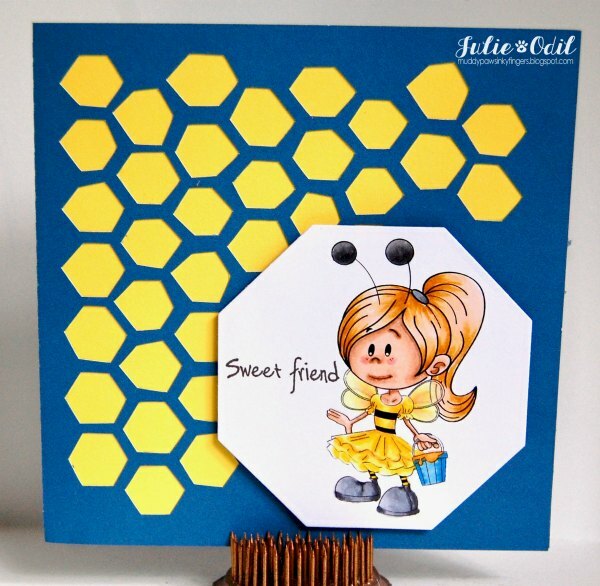 I cut out the Beeutiful image with a Spellbinders die to match the honeycomb theme. I hope you like my Beeutiful card, and visit the Sasayaki Glitter Stamps Etsy Store for more fantastic images you can purchase. Once you've done some shopping, there's a challenge here (the current theme is summer fun). There's also the Sasayaki Glitter Facebook Group, with a progressive monthly challenge going on. I'd like to thank Naz, Kel, and the rest of the design team for the opportunity to guest design this month. It's been awesome! It's Monday! 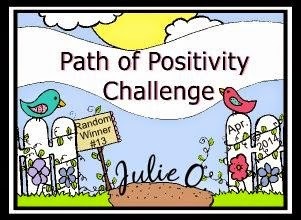 It's also time for some mid-month inspiration at The Path of Positivity Challenge Blog. This month's alternate color theme "neutrals". We have 2 sponsors this month: Mari Digis, and A Day for Daisies. For today's inspiration, I had the great pleasure of working with a digi from A Day for Daisies called, Mr. Right. With our neutral theme in mind, I colored Mr Right using shades of gray Copic markers, then added a few pops of blue green color. I don't know why, but as soon as I saw this digi, the couple looked old to me. Not just old fashioned, but old. So that is how I colored them. The papers on this card are from Close To My Heart, but are retired. The dies are from Spellbinders. The sentiment is computer generated. The ribbon is from my stash. 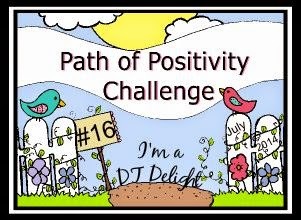 The challenges at The Path of Positivity run for a month. You have until July 2 to link up with your optional "neutral" projects, or link up any positive themed project you'd like. I'd love to see your creations! Sweet Summertime! I'm already sad that we're so close to the longest day of the year, and we'll be going back the other way. I love, love, love these long days of summer! Having all this daylight and warmth just makes me happy! 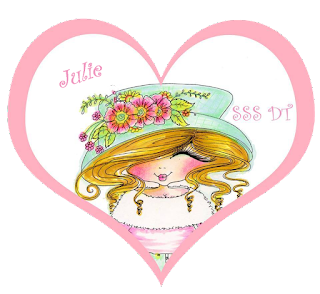 What also makes me very happy is sharing my first post for Di's Digi Stamps! 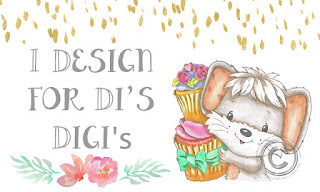 I've long admired and purchased Di's adorable creatures and cute kids, so I'm jumping with joy to be on her design team and have a chance to color them up on a regular basis! Di's Digi Designs Challenges are every fortnight, as they say in England, or every 2 weeks, as we like to say here in the states. 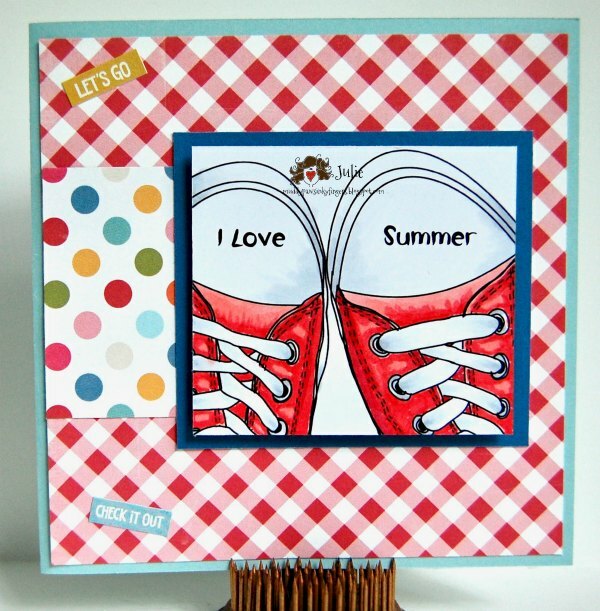 For the next 2 weeks, starting today, the theme is Summer Fun! Oh yeah! 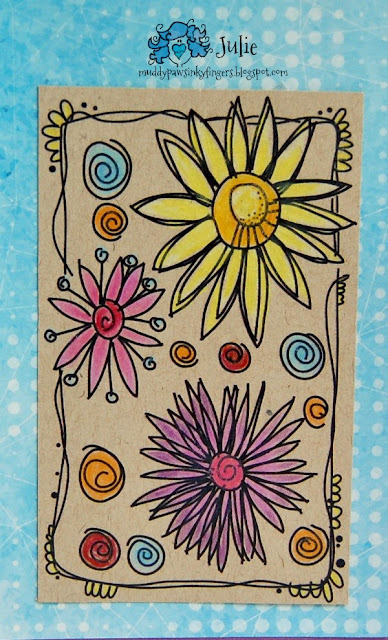 This digi stamp, called Daisy Trail, is so darn cute, isn't it? These creatures are certainly celebrating summer! They are reveling in the sweet, sweet smells and sights of those flowers and ladybugs. They are having a daisy dance, I believe. They are frolicking and having fun in the summer sun. I colored Daisy Trail with Copic markers, then used several sizes of Spellbinders dies to cut it out. The designer papers are from Close To My Heart. I computer generated the sentiment on this. That lovely ladybug charm has been in my stash for a long, long time, just waiting for the right card to use it on. I believe this was it! 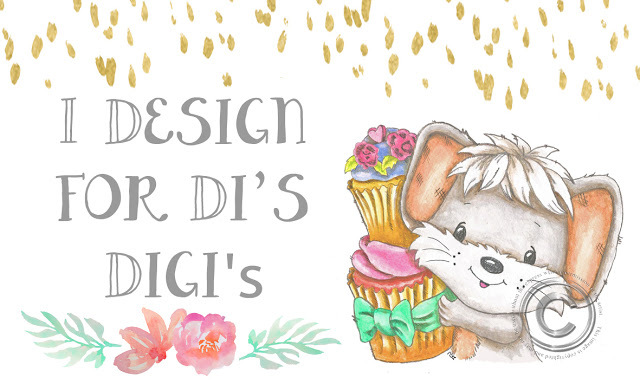 I hope you can join us at Di's Digi Designs Challenges these next 2 weeks for our Summer fun challenge. You have a great chance of winning if you use a Di's Digi image, and there's top 3, plus a random winner. Check out the shop for all the awesome digis and stamps, plus some really great bargain digis. Friday! It's also time for a new challenge at QKR Stampede challenge blog, where challenges are always Anything Goes -- every. single. week! Anything goes!!! 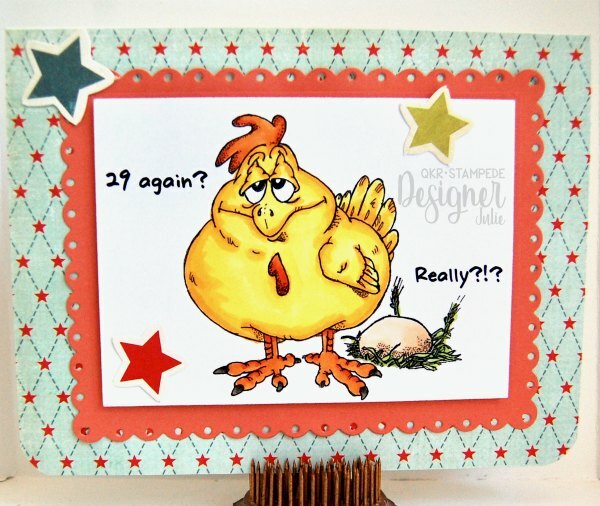 I had a great time making this birthday card, and I hope you join in on the fun this week at QKR Stampede Challenge Blog. 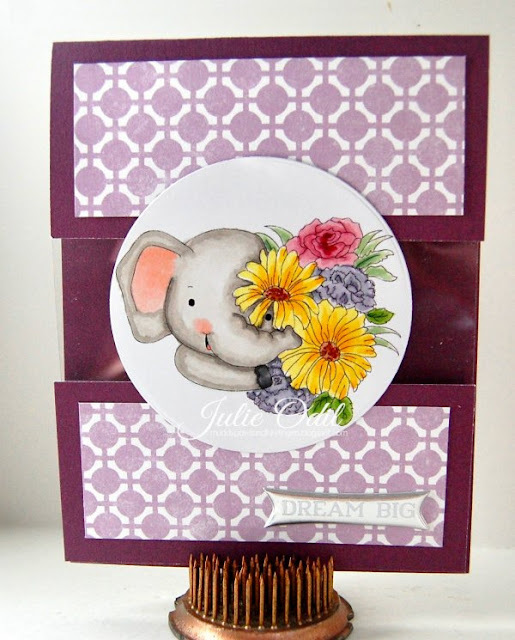 It's June 15, and that means it's time for some mid-month inspiration at DigiStamps4Joy Challenges. This month, our optional theme is "For the man in your life." Or, you can enter an Anything Goes project, if you prefer. 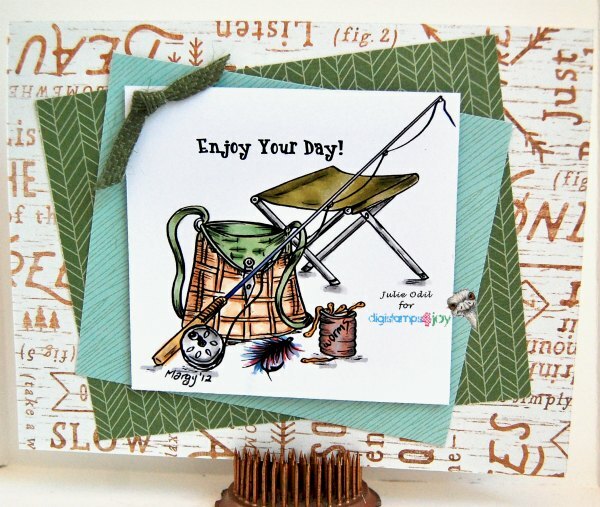 I found some rugged, outdoor papers and ribbon by Close To My Heart, and used those to complete the card. I used this as a birthday card for my nephew. He likes to fish on the Wisconsin River near his home. Happy Flag Day! I was at the nursing home this afternoon to play piano and help with the Flag Day program. The flag and what it stands for means so much to our older generation. I hope that kind of patriotism doesn't die out when they do! I colored up this image yesterday and made it into a card this morning in-between commitments. It's the freebie this month of June at the Outlawz Progressive Freebie. It's by We Are 3 Digital Shop. I colored this Tweet bird with Faber Castell colored pencils. It took a lot of coloring to get this image colored. My hand was cramping up! I used a sketch from the Outlawz Wednesday sketch to help me design the card. Greetings, crafty friends! I'm still in my first week of retirement, but I have to tell you, this is good stuff! It's a goal worth reaching for! Last evening a couple of my good friends took me out for a retirement dinner and it was so nice to be celebrated. Speaking of celebrating, do you like to dance? I've never been much of a dancer, but I admire the quality in others. Here in NW Wisconsin, most of our dancing seems to be done at wedding dances to a polka band, and most of the men need a few beers in them before they'll hit the dance floor. It's not the most elegant dancing you've ever seen. Isn't she sweet? My arthritic toes hurt just looking at her! But she sure is graceful! I love her sweet expression and confidence. 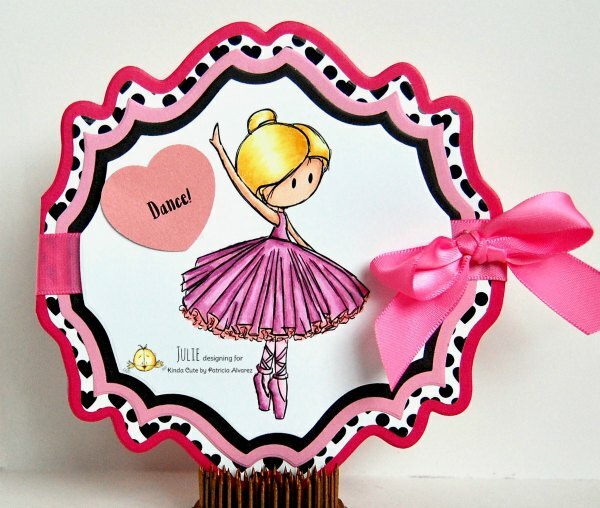 I colored this ballerina with Copic markers, then used dies from Yvonne to cut out the card. The dotted heart designer paper is also from Kinda Cute by Patricia Alvarez. She has some wonderful papers in her shop you can find HERE. Patricia had a recent release of mermaids and she has a sale going on in her shop right now. Use code 'mermay' to receive 50% off all digis in her shop! Start shopping! Visit the Kinda Cute Facebook group, too, for a monthly challenge, more inspiration, and some really great people! It's Monday, and usually that's not all that exciting, but today is an exception! Today, I'm honored to be guest designing at Sasayaki Glitter Digital Stamps. Woohoo! I'm so excited to be chosen! I'll be back again later in the month, too. Whoot!! 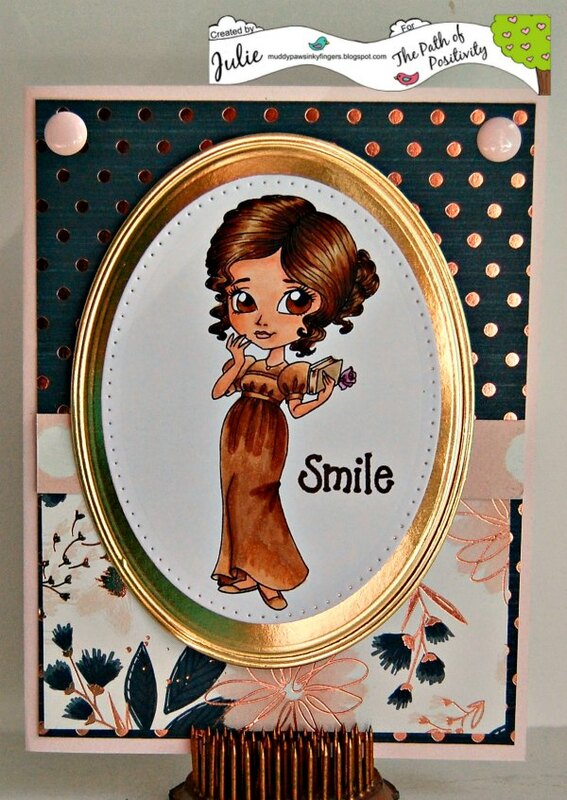 I colored Mia & Flower with Copic markers, and used several different Spellbinders dies to cut her out and back her. The sentiment, papers, and elements are all from Close To My Heart. The sketch used was found at The Outlawz, in their old sketches from past challenges. I'd like to thank Naz, Kel, and the Sasayaki Glitter Girls for the chance to guest design this month! It is totally my pleasure! Happy Saturday, everyone! I've been retired for a week already. It's hard to believe. I must admit, though, Saturdays don't have quite the impact they did when I was working full-time! Today is my first post for the Kitty Bee design team. 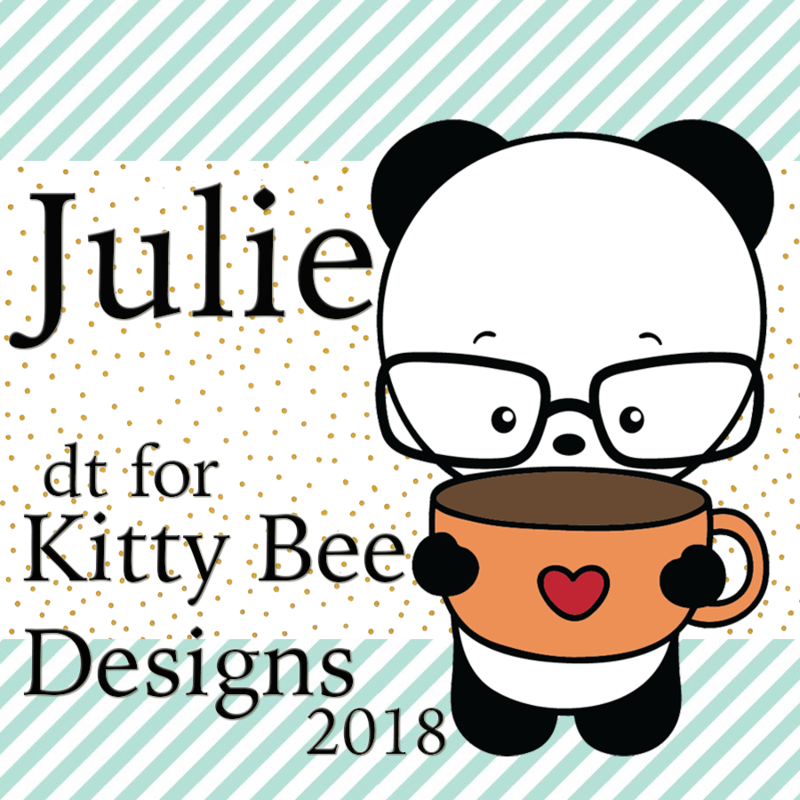 I'm the DT spotlight on the Kitty Bee Designs blog. You might say I'm "Over the Moon" with excitement! This is Cow Barely Over the Moon, colored with Copic markers. 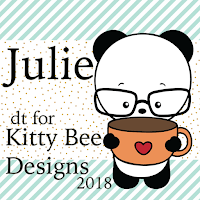 I live in Wisconsin, and June is Dairy month, so I thought it only right that I choose a cow for my first image to color from Kitty Bee Designs. Plus, I had this oh-so-fun moon and stars die I wanted to try out! 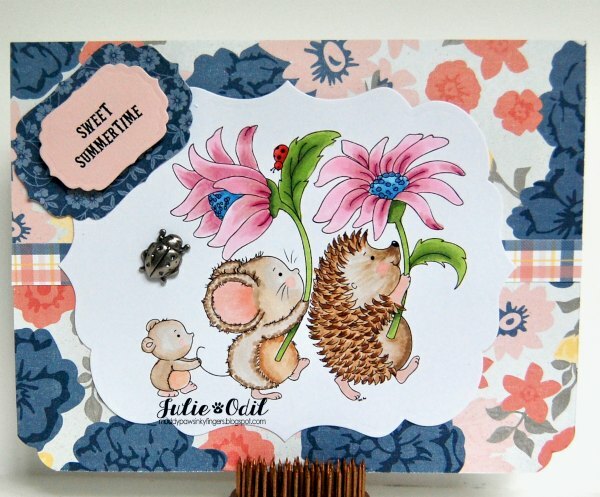 There are many adorable acrylic and digi stamps in the Kitty Bee Design Store. I hope you check it out. You're bound to find some have-to-haves! Join us each Friday for the Aloha Friday challenges. You'll see fantastic makes from the design team, and you can win some wonderful prizes from our sponsors! Friday! A great day of the week, and a great day for a new challenge at QKR Stampede Challenge Blog. Challenges are always Anything Goes! Don't you love it?!? That's almost as good as Friday! We're celebrating my Mother-in-law's birthday this weekend, so I was in need of a birthday card. I thought she might like this fun Bear with Sundae (Q-digi3001). What do you think? 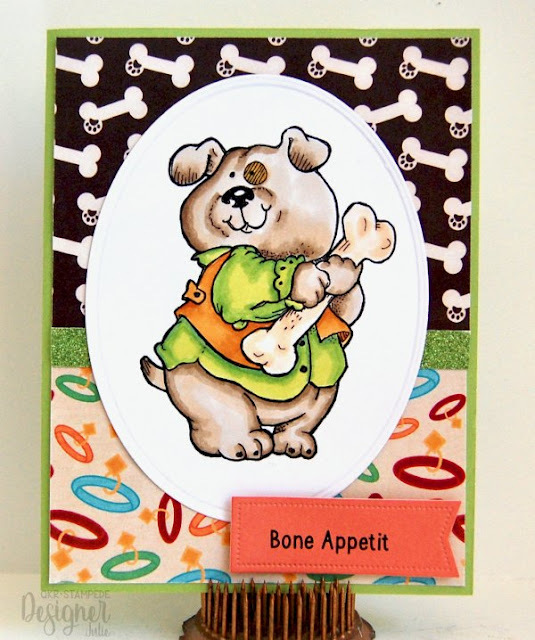 I colored up Bear with Sundae with Copic markers, found a festive designer paper that matched my colors, then layered some other colors behind the Bear. Super simple! 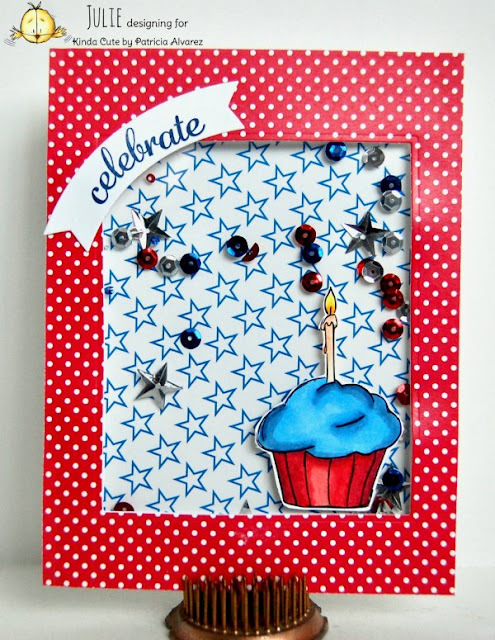 The embellishments from Close To My Heart looked like candy to me, so I thought they'd fit the sweet theme of my card. I hope you can join us this week at QKR Stampede. We have great digis you can win (like this one) and I'd love to see what you create! It's Thursday, and the weather here in NW Wisconsin has been turtle-y awesome this week! It's also turtle nesting season, so my dog, Gracie, and I are helping the turtles safely across our road whenever we see them. Slow down, cars! Let me cross! Speaking of turtles, this month's progressive challenge in the Sasayaki Glitter Facebook Group has a turtle-y awesome celebration image. 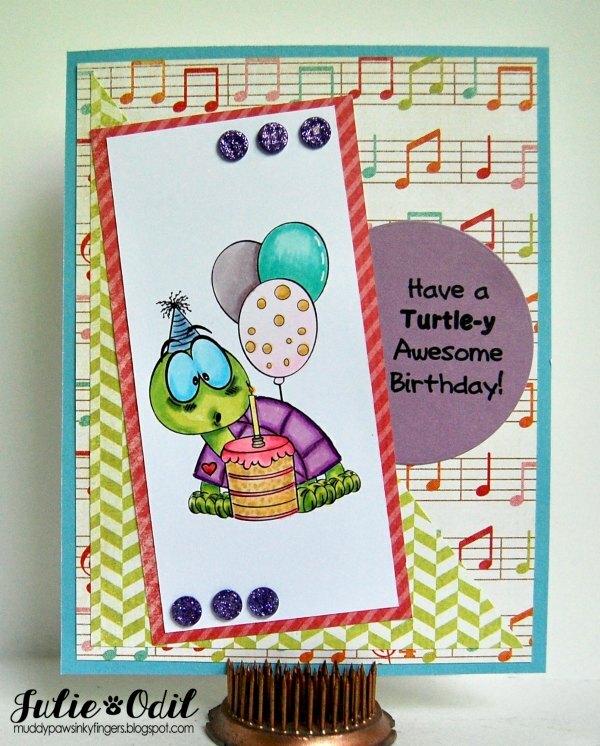 The image is a new release this month called Birthday Turtle. I colored Birthday Turtle with Copic markers, then used a sketch from this week's The Outlawz Wednesday Sketch Challenge to put the card together. The papers are some old, old, old My Mind's Eye. Remember the Alphabet Soup collection? The sentiment was computer generated. That's it for me today. Time to quit playing and get some work done! It's the first Wednesday of the month, so that means I'm posting today for Simply Crafty SVGs. I love Sandy's SVG files and I had great fun with today's picnic basket SVG file! I used some bright, cheerful papers that I found in my stash. They're from Close To My Heart (retired). 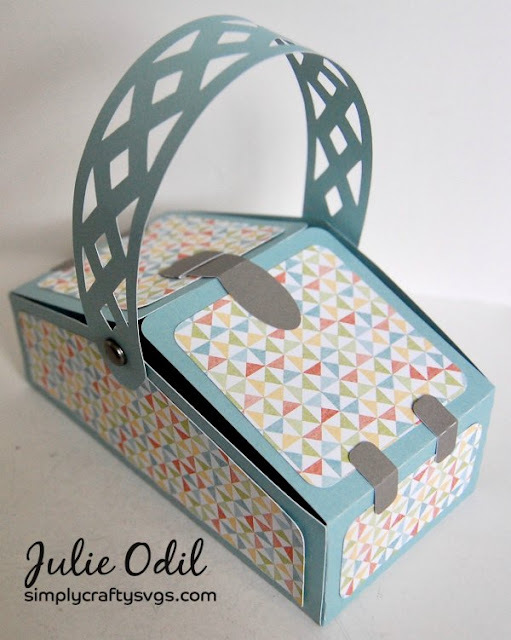 I gave this picnic basket to a friend with some chocolates inside and a gift certificate. It all fit inside nicely. She was thrilled with how cute it was! My first attempt, I used sticky backed card stock on the hinges, but it wasn't sticky enough to hold, so I re-cut the 4 hinges and the clasp out of regular card stock and used double sided tape to hold them on. That did the trick! (Here's a look at my first attempt -- hinges not holding, but it gives you a good view of the clasp on the lid). 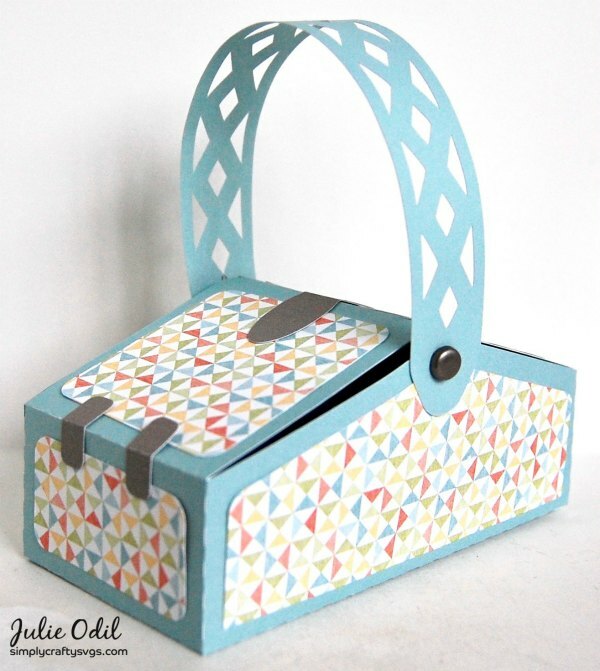 This picnic basket went together very easily and was such a hit with the recipient. I'll definitely be making this again! 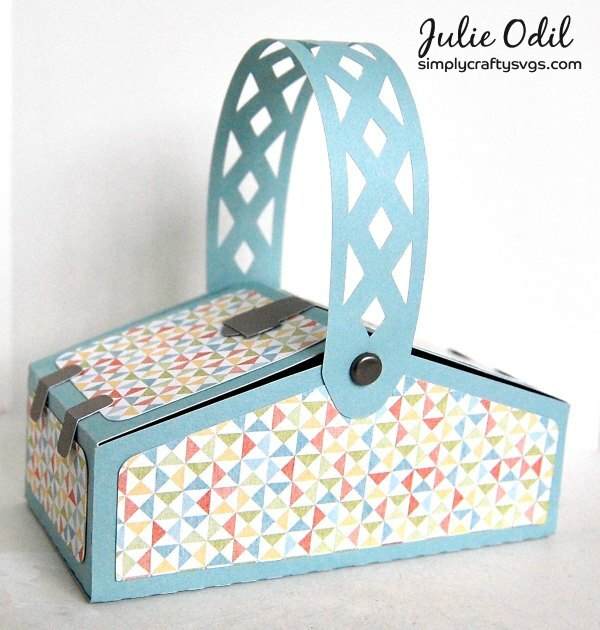 The Simply Crafty SVGs design team had a blog hop over Memorial Day weekend, and as I promised, I'm announcing the winner of the $5 Gift certificate to the Simply Crafty SVGs store today. 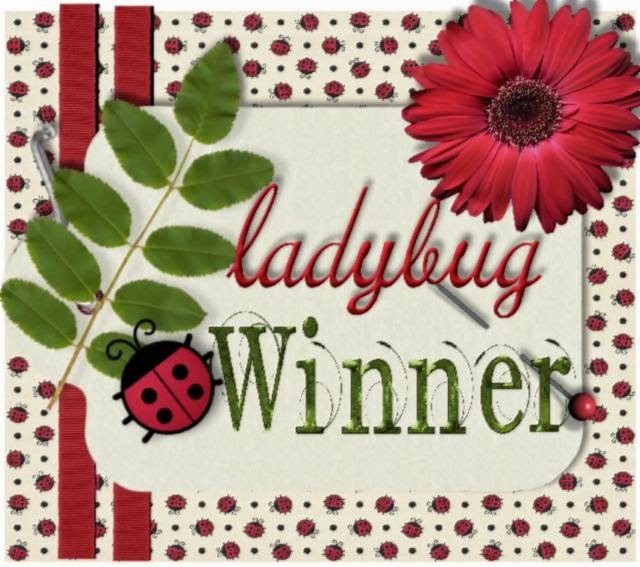 The winner, chosen by random.org from the comments on my blog on the hop is: Lisa Lynn. Contact me, Lisa, and I'll get your gift certificate to you. Congratulations! Make sure you check out the Simply Crafty SVGs store here. There are lots of freebies available and all the files are very reasonably priced (plus, tutorials with many files!!) 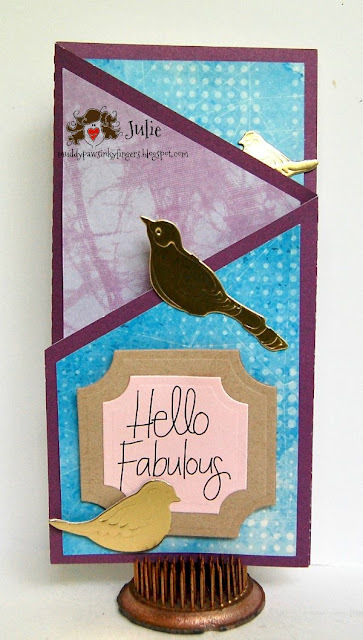 Then, check out the Simply Crafty SVGs blog for inspiration on what the talented design team does with the wonderful files Sandy creates for her store. 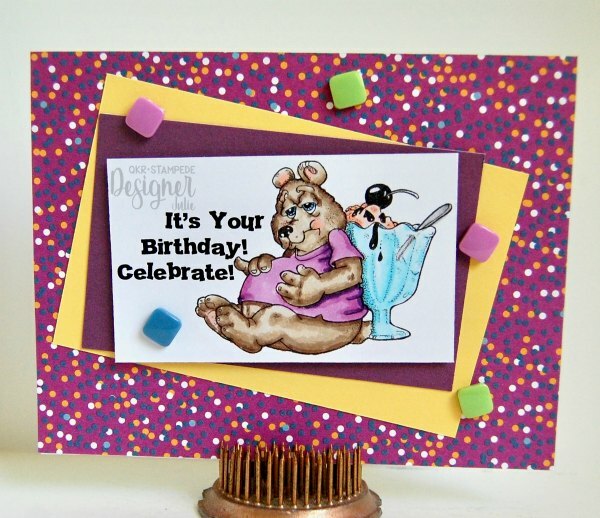 It's my day to post on the Addicted to Stamps blog for Sherri Baldy and her My Besties stamps. This month, we're featuring Boy Besties. See? This plumber is the cutest, isn't he? I couldn't resist computer generating that sentiment to go with him. I hope you check this Scrapbook Stamp Society blog often for even more Boy Besties inspiration. Also, there's the My Besties Creative Craft Club Facebook Group with tons of great inspiration and wonderful people! Check it out! Smile! It's Monday! It's also time for a new challenge at The Path of Positivity Challenge Blog. This month's alternate color theme "neutrals". We have 2 sponsors this month: Mari Digis, and A Day for Daisies. I colored this image using Copic markers and concentrating on neutral colors. The papers came in a card kit, so I don't know who they're by. I used Spellbinders dies to cut her out and back her. The gold foil paper is from Close To My Heart. 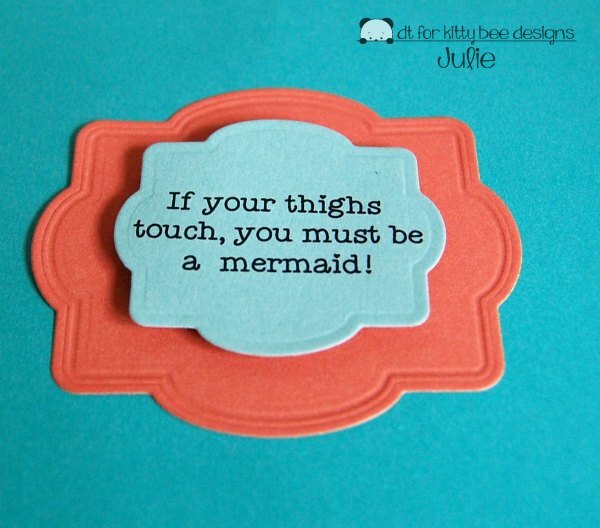 The sentiment is from Craftin' Desert Divas. 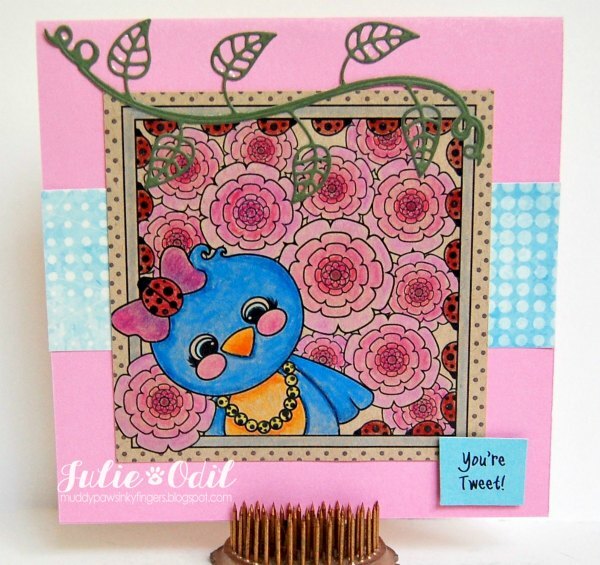 I used a card sketch from this week's challenge at The Outlawz Wednesday Challenge. June 1, and it's time for a new challenge at the 12 Months of Christmas Link Up. It's also time to add another Christmas card to the 2018 Christmas card stash! Yea! The alternate theme this month "Make It Masculine". We'd like you to make a card that would be considered masculine in order to qualify for the prize from our guest sponsor. This month, we have a new sponsor at The 12 Month of Christmas Link Up, and it's a great one! We're sponsored by SheepSki Designs. I colored Snowmen Selfie with Copic markers. 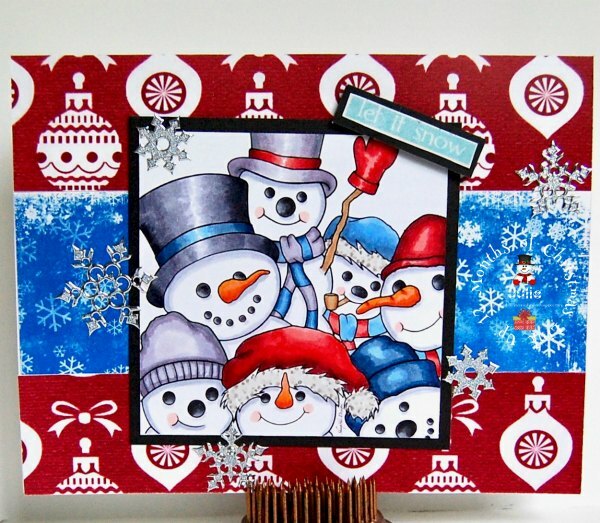 Each month, Decosse's Dynamite Doodles creates papers for the 12 Months of Christmas Link Up. Link up 2 cards and you'll get one of her awesome papers for yourself! I used 3 different Decosse's Dynamite Doodles Christmas papers on this card. The snowflake stickers are from Hot Off the Press. I hope you can join us this month for our "Make it Masculine" challenge at The 12 Months of Christmas Link Up. I'd love to see what you create, and you can win some awesome images or papers!